France, or French Republic (French: République française) is a country located in the west of Europe. The capital of France is Paris. It also owns territories on others continents (but not in Asia): Saint Pierre and Miquelon, Clipperton, Saint-Martin, Saint-Barthélemy, Guadeloupe, Martinique in North America, and Guyane in South America, Mayotte and Réunion in Africa, French Polynesia, New Caledonia et Wallis and Futuna in Oceania. It has some inhabited islets in the Indian Ocean and Adélie Land in Antarctica as well. Its territory stretches more than 640,000 km2. 120,000 km2 of its area is in Overseas, which is also known as the DOM-TOM (départements et territoires d'outre-mer; Departments and territories overseas). It is a republic. The official language is French and its currency is the Euro. France is a nuclear power. It is a member of the Permanent Council of UN. It is also one of the leaders of several fields such as agriculture, luxury goods, tourism, nuclear development, automotive manufacture and aerospace. More than 66 million inhabitants live in France, making it the most populous country of the European Union with high demographic growth. France is the fifth worldwide economic leader behind the United States, China, Japan and Germany. It has the largest army in Europe and the fourth largest army in the world. Evolution of metropolitan France's territory, from 985 to 1947. In the fifth century, the Franks invaded the country and gave it their name. Clovis, King of the Salian Franks (located in the North of France and Belgium), took over Gallo-Roman Gaul and claimed Paris as its capital. However, modern France was really born in the treaty of Verdun, in 843. This treaty divided the empire of Charlemagne in three and gave western France (France) to Charles the Bald. In 987, Hugh Capet ascended the throne of France and ended the Carolingian dynasty (descendants of Charlemagne). His descendants, the Capetians, sought to maintain royal authority over the nobles and expand the royal power. In the 14th century, during the Hundred Years' War, France was invaded by the English. Luckily, Joan of Arc and King Charles VII drove the English out of France. In 1789, a revolution broke out; in 1792, the Kingdom of France became the French Republic. 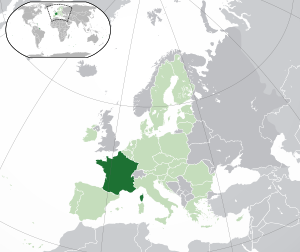 Location of France in Europe. The French Republic, which extends across metropolitan France and overseas territories, has a surface area of 675,417 km² and a population of about 65,400,000 inhabitants. Metropolitan France (that is to say the part of the mainland situated in geographical Europe) has an area of 547,030 km². France has 18 regions, 101 departments (including 96 in Metropolitan France and 5 on the overseas territories) and 36,790 municipalities. Metropolitan France is bordered by four coastlines along the North Sea, The Channel, the Atlantic Ocean and the Mediterranean Sea. It presents a wide variety of landscapes. The main mountains are the Alps (Mont Blanc is 4,810 m high), the Pyrenees and smaller ones such as the Massif Central, the Jura, the Vosges, the Massif Armorican, and the Ardennes mountains. It's the second most populous country in Europe. The principal mountain ranges are the Alpes and the Pyrenees. It's bordered by the North Sea, the English Channel, the Atlantic Ocean, and the Mediterranean Sea. The main rivers are the Loire, the Rhône, the Garonne, the Seine, and part of the Rhine. Demographic density map of France. The population of France was 66 million inhabitants in 2013: 64 million in metropolitan France and 2 million in the overseas territories. The overall average density of the territory (with the DOM-TOM) is about 94 inhabitants per square kilometer, but the average population for the mainland is 117 inhabitants per square kilometer, because overseas territories include sparsely populated areas, such as Guyana and New Caledonia that add, has together nearly 110,000 km, but has less than half a million inhabitants. France was a kingdom until September 1792. The Napoleonic First Empire began on May 1804. After the Napoleonic defeat, France became a kingdom (Restoration (1814-1830) and July Monarchy (1830-1848)), then the Second Republic (1848-1852), then the Second Empire (1852-1870), and afterwards succeeded three republics : the Third Republic (1870-1940), the Fourth Republic (1946-1958) and the Fifth Republic since 1958. The French Republic was created following the French Revolution in 1789. France is a republic, "indivisible, secular, democratic and social" (1st article of the Constitution of Demography of France). It is lead by the president (currently Emmanuel Macron, elected by universal suffrage by the French citizens after the French presidential election of 2017, whose term lasts five years (since its reform in 2001). It is he who appoints the Prime Minister (currently Edouard Philippe), who heads the government. The Parliament, composed of the National Assembly (577 members) and the Senate (331 Senators), voting laws and controlling the actions of the government. France is actually in its Fifth Republic and is part of the European Union, of which it is one of the founder countries. In 2007, there were about two million unemployed people. France is the fifth economic power in the world; it suffered a severe economic crisis in 2008. The Eiffel Tower is the most visited paid monument of France and of the world. France is the first country in the world in terms of tourism: its landscapes are varied, there are castles, seaside resorts, ski resorts, mountainous areas and even extinct volcanos. Historic, architectural, and artistic heritage of the country are exceptional. It has 38 sites designated by UNESCO (ranked 4th in the world for most UNESCO sites) and has many places among the most visited in the world: the Eiffel Tower, the Louvre, Mont St Michel. Other cities than Paris are interesting too, like Lyon, Bordeaux, Marseille or Strasbourg. There is another type of tourism: gastronomic tourism. Indeed, France is reputed for its excellent cooking, maybe the best in the world, with its famous bread baguettes, wines, and cheeses. It is also the home of the Cordon Bleu cookery school. The Blue Ribbon is a sign of some of the best Chefs in the world. One of the favorite sports in France is football. France won the football World Cup in 1998. Other popular sports in France are rugby, tennis, table tennis, skiing, judo, and the ballet. France has numerous composers of classical music, like Maurice Ravel, Hector Berlioz, or Erik Satie. In the sphere of light music, Tino Rossi has sold over 300 million records worldwide, Johnny Hallyday has sold 100 million and Edith Piaf remains the most famous representative of the French chanson. Other famous French singers include Serge Gainsbourg, Charles Aznavour, and Yves Montand. It also has many painters and sculptors: Honoré Daumier, Gustave Courbet, Monet (who invented impressionism), Matisse, Renoir, Braque (who invented Cubism with Picasso), Degas, Seurat, Géricault, Delacroix, Cézanna or Manet. 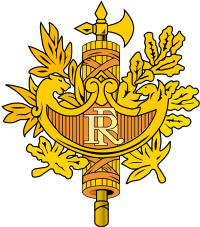 Emblem of the French Republic. The motto of the French Republic is Liberté, Égalité et Fraternité (Liberty, Equality, Fraternity). It appeared during the revolution in 1789. Rouget of Lisle, singing La Marseillaise. La Marseillaise is the national anthem of France. It was written by Claude Joseph Rouget in Lisle in 1792 to support the French Revolution. The soldiers from Marseille of Provenance sung La Marseillaise upon arriving in Paris. Therefore, the Parisians had called it so. It then became an official song in 1795. Marianne is the first name of numerous women during the French Revolution in 1789. It symbolizes the motto "Liberty, Equality, Fraternity". For the French revolutionaries, Marianne represented the French people who were fighting for liberty. The table of Eugène Delacroix is "Liberty Leading the People", which illustrates Marianne fighting for his people. red: the color of the blood spilled in order to liberate the people (or the other of Paris). The blue and the red represent the colors of the city of Paris, combined with white, color of the king. Some see the flag as one of the "two colors of the French Revolution that imprisoned the king". Besides, the French flag was born during the revolution. Colors that are not specific to France! For example, the flags of the Czech Republic and the Netherlands have the same colors as the French flag (but distributed differently since a national flag is not identical to another national flag, excluding those of Monaco and Indonesia). Languages of France in songs by the Hall of Songs and the General Delegation for the French Language and the Languages of France, with the support of Ministry of Culture and Communication: outside the French, it is known as "Langues de France" regional or minority languages traditionally spoken by French citizens (accessed February 6, 2008). 1. ↑ The French Republic (§ France is definitely Republican), Resources on-cla. univ-fcomte. fr. Accessed March 13, 2010. 2. ↑ 2.0 2.1 2.2 The symbols of the French Republic on Resources-cla. univ-fcomte. fr. Accessed March 13, 2010. 3. ↑ Liberty Leading the People, Letters. ac-rouen. fr. Accessed March 13, 2010. This page was last edited on 31 March 2019, at 08:51.